For just $2 you can have an ad free version of this tutorial and more. Buy this pattern in my Etsy shop for just $2. ch; Chain – yarn over working yarn, pull through the loop, repeat. sl st; Slip Stitch – insert hook, yarn over (yo), pull through stitch, pull through the loop on hook. sc; single crochet – insert hook, yarn over, pull through stitch, yo, pull through both loops on hook. hdc; half double crochet – yo, insert hook, yo, pull through stitch, yo, pull through all three loops on hook. dc; double crochet – yo, insert hook, yo, pull through stitch, yo pull through first two stitches, yo pull through last two stitches. Shell Stitch – is a variation of stitches created in a single stitch to create an arc or in this case a crown point. The variation I am using is 3hdc, dc, chain 2, slip stitch in first chain (this is the peak of the crown point), 3hdc. * Refers to the beginning of a repeated group of stitches. Yarn; I used Lion Brand Hometown USA in the color Miami Seafoam. This is a bulky yarn and works up quick. Hook – I used 7mm. You will need to know the circumference of the head you are going to fit the ear warmer on. If you do not know the circumference there are handy charts you can find online with average sizes. Chain to the needed size. I measure my chain stretched out to the measurement of my circumference. Join the yarn making a circle. Be careful not to twist your circle. This will be the base of the crown. Half double crochet in each stitch, starting in the next chain space. I always crochet in the backbone of the chain, it makes for a cleaner edge on the finished product. 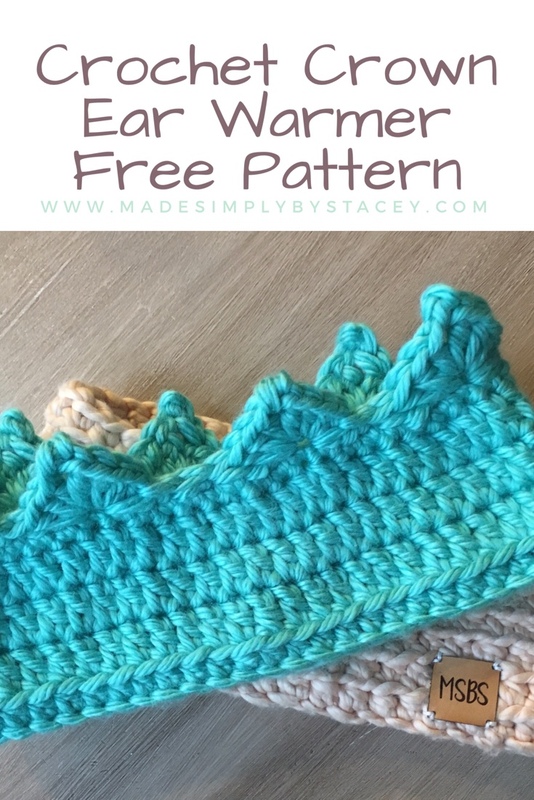 Join into the front two loops of your first half double crochet. Chain 2 (this counts as a double crochet), double crochet in the back two loops of each stitch. Slip stitch in your first double crochet (Chain two). Chain 2 (this counts as a double crochet), double crochet in each stitch (you can continue to crochet in the back loop to create a ribbed look). Slip stitch in your first double crochet (Chain two). Chain 1, single crochet around. Chain 1 *skip two stitches, slip stitch in third stitch, skip two stitches, slip stitch in third stitch, shell stitch in that same stitch. repeat from * until the end of the round. Ta-da super cute crochet crown ear warmer for your favorite queen. You can start this ear warmer with any basic ear warmer pattern. You can add different colors or even bedazzle some jewels or colorful buttons. For just $2 you can have an ad free version of this tutorial. Would you like to be notified when I post again? Subscribe to my blog and you will get an email letting you know. Shop Made Simply by Stacey for ad free versions of my tutorials. Thank you.